In February 2016, the City of Medicine Hat designated the Elizabeth Street School as a Municipal Historic Resource. In September, a plaque about the school’s history and designation was unveiled. The school is the most recent of Medicine Hat’s historic resources to be listed on the Alberta Register of Historic Places. Elizabeth Street School during construction, ca. 1912. The school’s Classical Revival details, notably the cornice at the roofline and the keystone and voissoir details around the entryways, are evident. Alberta Historical Resources Foundation 2016 Heritage Award Recipients. The night of October 14 was filled with pride and honour as award recipients, guests, staff and board members celebrated the biennial Heritage Awards at the historic McDougall Centre in Calgary. 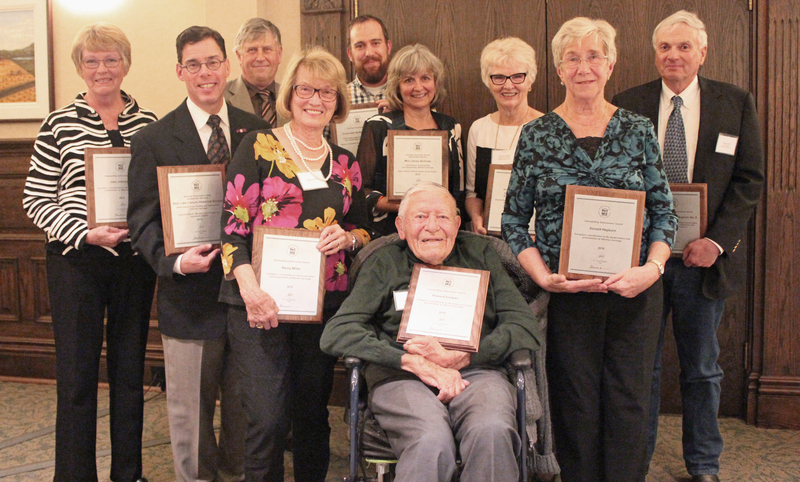 The Alberta Historical Resources Foundation presented the awards in four categories to 14 deserving individuals and organizations in recognition of their accomplishments and contribution to the preservation and promotion of Alberta’s heritage. Additional information is available on the Alberta Historical Resources Foundation webpage at http://culture.alberta.ca/heritage-and-museums/grants-and-recognition/heritage-awards/. Congratulations and thank you to all Heritage Award Recipients! Shortly before his death in April of 1915 while serving with the Royal Navy Volunteer Reserve, English poet Rupert Brooke penned the now famous lines of The Soldier. He surmised that should he die during the course of the war, there would be some corner of a foreign field “That is for ever England”. In a similar vein, one might consider the ultimate sacrifices paid by Albertans during two World Wars and their final resting places as corners of foreign fields that are for ever Alberta. You may have recently seen a news story about archaeological finds at McKinnon Flats, approximately 22 km southeast of Calgary (see below for news links). Today, McKinnon Flats is a popular recreational area, used for fishing, hiking and bird watching. But did you know that five centuries ago it may also have been used for bison hunting and camping?